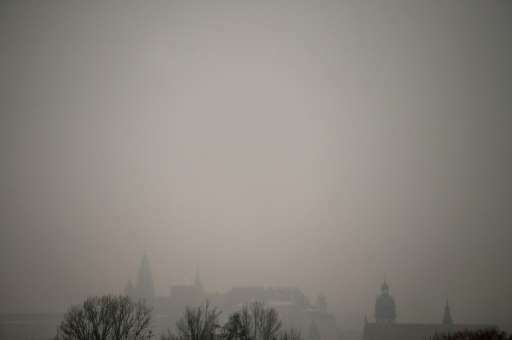 The soupy grey smog shrouding Polish cities this winter is one of the most visible symptoms of the EU member's addiction to coal, a deadly habit forcing many to stay indoors or don masks before venturing out. Professor Anna Doboszynska, a respected specialist with more than two decades of experience treating lung disease, minces no words about the health risks it poses. 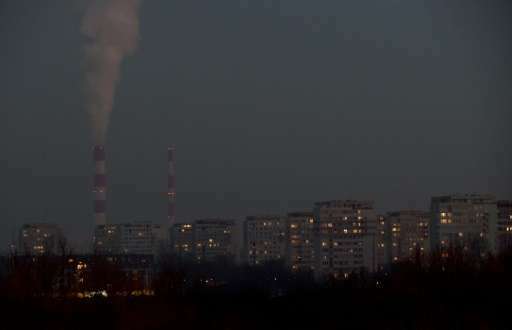 "During periods of smog, more people with respiratory and circulatory illnesses actually die," she told AFP after examining an asthma patient wheezing heavily amid a spike in pollution in Warsaw. "Children, pregnant women and the elderly are most at risk from smog, which damages the respiratory tract much in the same way smoking does. "A child playing outside in the smog is smoking cigarettes, it's the same thing," she told AFP. One Warsaw hospital reported a 50 percent spike in patients over several days of intense smog during a windless cold snap in January. As anti-smog masks sold out across Poland this week, Warsaw issued them to police officers on duty across the capital. A study published last year by the European Environmental Agency (EEA) blamed air pollution—caused in large part by the burning of coal—for an estimated 50,000 premature deaths per year in the country of 38 million people. 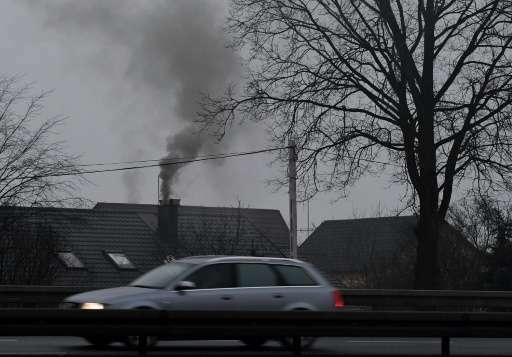 Seventy percent of Polish households burn low-quality coal or rubbish in old stoves for heat and antiquated coal-fired power plants generate nearly all of Poland's electricity, giving it some of the dirtiest air in the 28-member EU. The EEA also blames so-called "low-stack" emissions from old household stoves for countless cases of respiratory illness. The AirVisuals website regularly lists Warsaw, Katowice or Krakow among the world's top ten most polluted cities alongside Beijing or New Delhi. Karolina, a Warsaw mother of three who did not wish to reveal her surname, says checking mobile phone apps for smog levels and wearing masks have become part of her family's daily routine. "My son's had pneumonia twice within the last 10 months and my daughter was sick all October and November. But, of course, nobody's blaming smog, even though we live in an area of Warsaw where there's chronic air pollution," she told AFP. "What scares me the most is the total lack of information and government inaction. "There are days on end when the smog is so bad that school and kindergarten should be closed, but nothing is being done." Authorities in Poland only alert the public when air pollution exceeds the EU-wide norm by a whopping 600 percent, according to Piotr Siergiej, an activist with anti-smog NGO "Alarm Smogowy". The EU limit for exposure to fine air pollutants known as PM 10 particles is 50 microgrammes per cubic meter per day. "In Paris, authorities announce smog alerts and take action when pollution exceeds 80 microgrammes per cubic meter per day," Siergiej told AFP. "In Poland, the alert level is 300 microgrammes," he added, slamming the measure as a "health hazard". Poland's environment ministry recently rejected a request by his group for smog alerts— when children, the ill and the elderly are advised to stay indoors— to be issued automatically when pollution levels spike to twice the EU-wide norm. Instead, the government, led by the right-wing Law and Justice (PiS) party, has vowed to ban low-quality coal and limit sales of the worst-polluting home furnaces over the next three months. A report issued last month by the International Energy Agency identified air pollution as "one of the largest environmental health risks" facing Poles. It also urged Warsaw to rethink its dependence on coal and focus instead on developing cleaner energy sources. According to the IEA, coal accounted for 81 percent of Poland's electricity generation in 2015 and the heavily indebted coal-mining sector—one of Europe's largest—provided more than 100,000 politically sensitive jobs. The right-wing government of Beata Szydlo, the daughter of a coalminer, has long insisted that plentiful domestic coal is key to Poland's energy security. Her administration has also set tough regulations on the installation of wind turbines, in effect blocking competition from the renewables sector, which in 2014 covered about 10 percent of national energy needs. The IEA concluded that "the future of renewable energy in Poland looks uncertain", dimming hope for cleaner air anytime soon. Yeah, it's killing us, . . . . but it's cheap! yet more evidence why we should push for more renewables. How exactly can a finite resource be considered a source of 'security'? For all those who don't consider climate change real: Just ignore that aspect and focus on health, your wallet, and national (energy) security. If any of these are reasons you accept (and if not then you have some *serious* explaining to do) then you should be gung-ho for renewables. GREED and corruption does not care about the consequences. As long as the money flows in, everything else is unimportant. That smog does not stay in Poland. Perhaps we should put together an international fund to do these jobs, and rent the equipment to the countries, . . for the sake of ALL of us. ..which is perfectly fine. No one is asking anyone to switch over in a day. A mixed setup during a transition phase of 30-50 years is perfectly OK. In any case: Poland is part of the EU energy grid, so they can benefit from the times other countries around them produce surplus renewable power (which has to be sold at negative prices in extreme cases). Transitioning away from a mining economy is painful, but there's really no alternative to it. Even if you refuse: at some point economically viable coal mining runs out and then you're stuck with the problem all in one go. Better to start a gradual transition now than wait and hit the wall. In any case: Poland is part of the EU energy grid, so they can benefit from the times other countries around them produce surplus renewable power (which has to be sold at negative prices in extreme cases). They already are. Poland exports roughly 12 billion kWh of electricity a year and imports 9 billion kWh - mostly due to the energy fluctuation in the German grid thanks to renewables. They buy cheap and then sell coal power back to Germany when they have a lack of wind and sun. That's the virtual battery in action. Due to the close proximity, renewable energy IN Poland would hurt that business, because when it's windy in Germany it's windy in Poland and vice versa. They'd both have surplus or deficit at around the same times. The virtual battery only works properly if one has renewables and the other doesn't. Of course, hydroelectricity and biomass are compatible because they're not intermittent. They're just not very available.